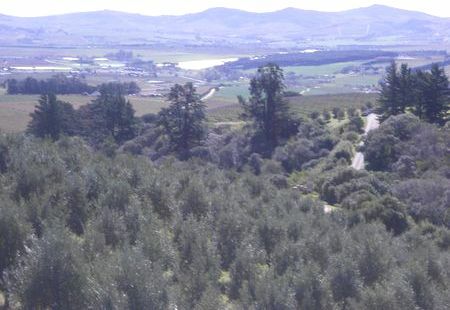 Perched high in the Helderberg Mountains on the Hidden Valley Wine Estate near Stellenbosch in the Western Cape, there is a special place. To reach this place requires one to motor up a not too steep winding road Suddenly, around one of the bends in the road, is the sight of a building of stone, glass and steel which appears to rise miraculously from a magnificent flurry of fynbos This is the mountain home of Overture Restaurant and the lair of the man that inhabits it, Chef Bertus Basson. and huge windows draws one in. Immediately one is struck by the efficiency and courtesy of the staff. How lovely to be greeted by a friendly welcoming smile and none of the cold hauteur of reception staff that has become the signature of so many restaurants and eateries. We were shown to our table outside under a pergola-covered extension of the restaurant. The space is beautifully arranged so as to allow everyone access to the breathtaking view and a feeling of intimacy within one's own space. The chairs are spacious and comfortably upholstered and the tables, beautifully dressed, with gold cloths sweeping the ground and sparkling white embossed linen covers. Wooden rectangles serve as side plates, covered for the moment, with large embossed linen napkins. Shining glasses standing to attention tease one with the promise of the wines to come. We were settled and made to feel cosseted and special by the charming young woman who was to be our waitress. A lovely touch, a glass of bubbles arrived at the table, Boschendal Brut Rose, which we sipped while we perused the menu. The menu offers all sorts of possibilities. One can order each dish with a matching wine, or simply order any wine you like, if you like. 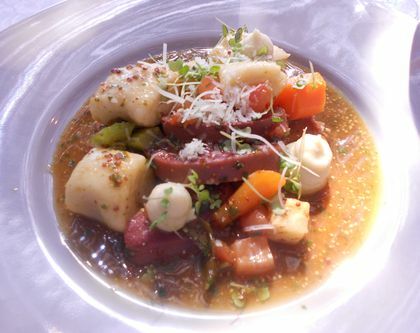 There are the options of a 4 or 5 Course Chef's Menu and even an 8 Course Tasting Menu. However, Eugene and I decided to make random choices and to order without any particular grouping. What a quandary! We wanted everything! Beautifully presented homemade bread arrived, rosemary and garlic focaccio and coriander ciabbata. These were accompanied by a wooden board with slices of smoked ham, a small dish of garlic emulsion and a plate of tomato seeds. On a previous visit, we had enjoyed succulent chicken wings while we waited. The amuse bouche depends entirely each day on the whim of our Chef Extraordinaire. We had spotted him earlier working away in the open plan kitchen of the restaurant. Later, we would speak to him and learn more about the man and his remarkable talent. There is a compact wine list with some available by the glass. Thembi, the sommelier, guided us through the wines. He has an abiding love and knowledge about wine. He immediately gauged which wine I would like and without any of the flummery that usually accompanies a sommelier's performance, described a wine he had chosen. He was absolutely right. Eugene was driving and therefore could only have a glass or two, but nevertheless was delighted with the wine that Thembi recommended. Our beetroot starter was a triumph. The deep ruby and purple colours of the beetroot variations looked marvellous on a white platter. Beetroot puree, beetroot jelly, beetroot and cumin ice and pockets of beetroot filled with mustard cream cheese were garnished with Parmesan shavings and feathery crostinis. 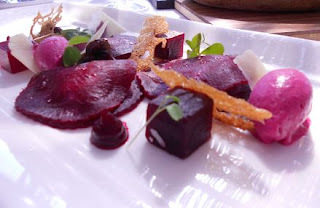 Imagine the humble beetroot being the main player in such an elegant dish. We loved it and unashamedly mopped it all up with our lovely bread. There was no letdown in the dishes that followed. They were all superb. 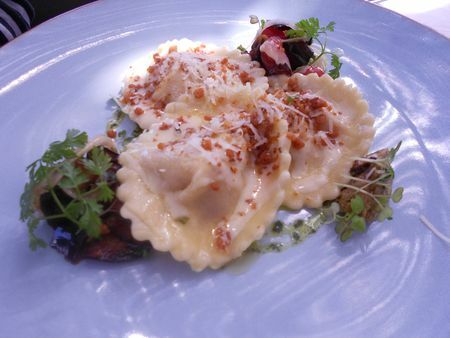 My tomato ravioli were delicate and delicious and Eugene's picled ox tongue dish was a marvellous medley of tastes. Onwards and there were new delights in store. The Rooibos smoked hake was succulent and unctuous. Eugene pronounced the confit lamb shoulder as excellent and of course I tasted it. Braised potatoes with thyme cream in a small wooden bowl was served as an accompaniment for the lamb. Tannie Hetta's apple tart is Bertus' mother's recipe and it is all that an old family recipe should be. There was the apple tart beautifully marooned in the centre of the plate surrounded by caramel sauce and a really divine, of course homemade, vanilla ice cream. A Lucullan feast! Oh, and in between the main course and the dessert a mischievously light palate cleanser of strawberry puree and fromage blanc. 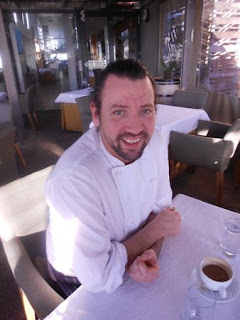 Meeting the man, Bertus Basson, is to realise that the chef and the man are indivisible. Food is his passion and his raison d'etre. Charming and easy to talk to, he shares his story with me. 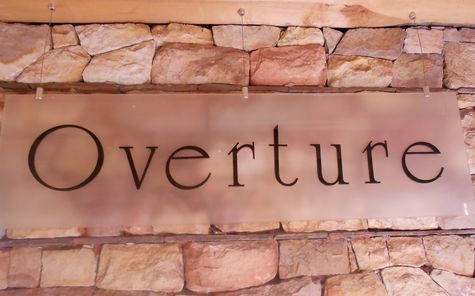 He and his business and culinary partner Craig Cormack, opened Overture in 2007. Both award winning chefs, they had established a company, 'All Things Culinary'. Besides a catering arm, they have also indulged their love of the craft and the art by teaching junior chefs at various cooking schools in the Western Cape. Two restaurants were designed, styled and launched by these two hightly gifted young men and they have their own wine label, Collaboration, a chenin blanc. 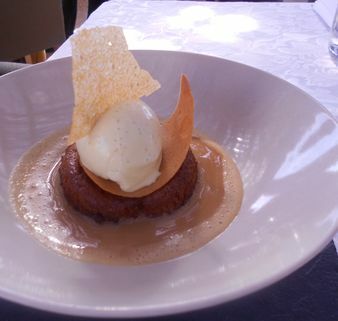 In 2010, Craig and Bertus opened opened another restaurant, Sofia, at Morgenster, which Craig has made his main focus and signature restaurant. Bertus presides over Overture, bringing all his very considerable energy and massive talent to bear. He talks of his childhood, learning the love of cooking from his mother and grandmother. He honed his skills working in kitchens in South Africa and abroad and is always travelling and absorbing the tastes and smells and secrets of different cuisines. He runs Overture with driving resolve. Menus change daily, as fresh produce is the only currency in which he deals and whatever the market yields on the day. He does all his own butchering and has a cold room where he can store his meat. No vacuum packed cuts for this chef. Fish is cleaned on the premises and enjoyed by his guests on the same day as it is caught. Naturally all the bread is homemade. He regaled us with stories of his dinner parties at his home for his friends. He described a cassoulet that he was serving to his friends that evening. Goodness, it almost brought tears to my eyes. Laughingly he describes how the restaurant, in his words, 'eats girlfriends'. 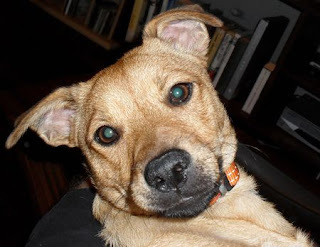 His most enduring relationship is with his beloved dog, Patat, a rescue dog of very mixed origin. Oh wow, I wonder if Patat eats cassoulet? 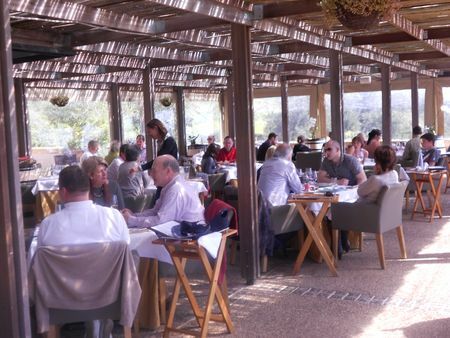 Bertus has a mantra that a restaurant should restore mind, body, soul and stomach. He succeeds wonderfully. p.s. Patat is the Afrikaans word for Sweet Potato. 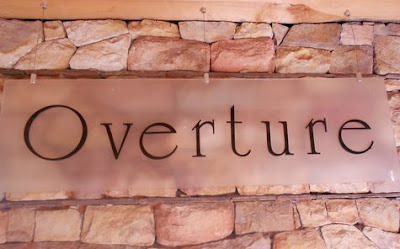 Overture is open for lunch: Tuesday to Sunday from 12 noon. dinner: Thursday and Friday from 7 pm. Beautifully written. Who is Thembi the sommelier?